"Our latest MyHumana mobile app embodies a ‘make it easy for me’ design that both pioneers simplicity and inspires health." 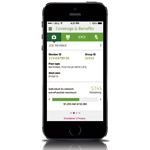 LOUISVILLE, Ky.--(BUSINESS WIRE)--Millions of Humana members will now find a more seamless, integrated mobile experience when they sign on to the MyHumana mobile app. To help meet the increasingly mobile needs of Humana’s multi-generational member population, as well as in response to individual member feedback, Humana Inc. (NYSE: HUM) has updated its industry-leading MyHumana Mobile app to feature a brand new design, enhanced user experience and better information flow to drive engagement and self-service with members. The updated app will continue to show the same information that individuals can access today from their desktop including their health savings account balance, deductible and claims information, as well as coverage and benefits information. The MyHumana mobile app is free and available for download for both Apple and Android smartphones. Humana members with the ability to create a MyHumana account on the web will have access to the app. The app first launched in March 2010 and continues to evolve in response to changing member needs and industry trends. Individuals can also access relevant information about their health benefits by directing their mobile browser to www.humana.com. As part of its continued efforts to improve the consumer experience, Humana expects to make additional enhancements to the MyHumana mobile app over the next year and beyond.